2016 Medieval Madness Standard Edition for sale from Arcades at Home serving Romeoville and the surrounding Chicago area. Chicago Gaming remake of the classic game Medieval Madness. Widely held as one of the most popular games of all time. 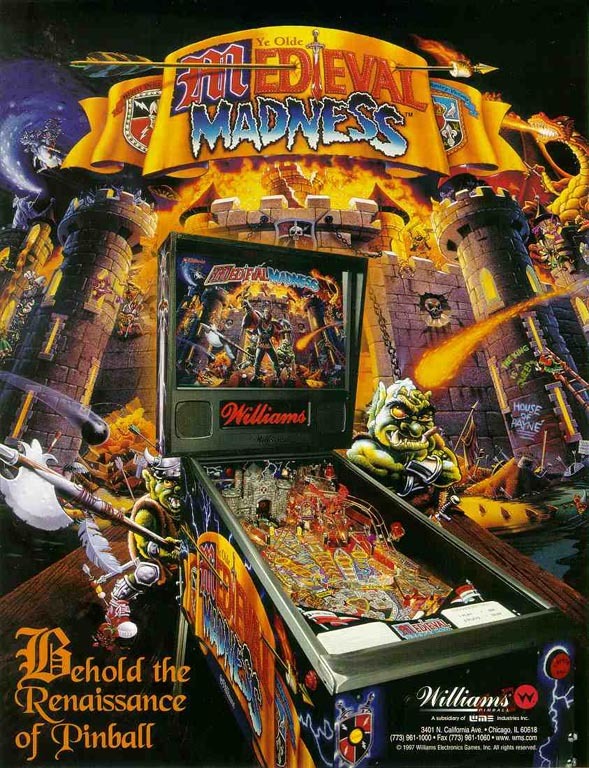 Medieval Madness is widely held to be one of the best pinball machines of all time! Chicago Gaming and Planetary Pinball have created a brand new 2016 remake of the classic pinball machine Medieval Madness. Many updates include modernized electronics, adjustable color display, LED lighting, and a class D digital audio amplifier. Your remake of Medieval Madness will be shipped brand new in a box directly from Chicago Gaming. Own a part of pinball history! Check out the Medieval Madness promotional video featuring pinball historian Roger Sharpe and one of the MMR pre-production games.